What is the Best Tile Flooring Option for Pet Owners? Pets can bring immeasurable joy into our lives. Unfortunately, their nails and muddy paws can wreak havoc on flooring. The following are the best tile flooring option for pet owners that won’t be damaged by your little buddy. Natural stone tile flooring, such as granite, is a good choice because it is difficult to scratch; if Fido has an accident it won’t damage the tile. On a hot day, your stone tile floors are guaranteed to be your pet’s favorite spot to lay out while they remain nice and cool. 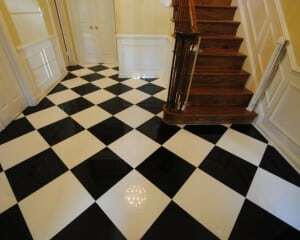 Porcelain or ceramic tile are also good choices. Neither scratch easily, and urine, water, and other fluids won’t damage them a bit. On the downside, their hardness can make them uncomfortable for pets at times, which is why it’s a good idea to add an area rug on top of your flooring. This gives your pets a place rest comfortably while you cook or perform other activities. Our team would be glad to help you choose the best tile floors for pet owners. If you want a floor that will be protected from pets within your home, contact us at Conestoga Tile and we’ll be glad to help.